This date is the origin of Carrington rotation numbers, a count of the rotation of the Sun. A Carrington Rotation is the time of one full rotation of the Sun as seen from the Earth. The mean period for a single rotation is 27.2753 days. Carrington Rotation numbers are arbitrarily referenced to the time the term came into use, on November 9, 1853. The Wright brothers made their first airplane flight that lasted more than 5 minutes. W. Baade discovered asteroids #966 Muschi, #967 Helionape and #1103 Sequoia. L. Boyer discovered asteroid #1851 Lacroute. K. Reinmuth discovered asteroid #3265. NASA/USAF launched X-15A Mach 6, Aero, Stab Test mission # 45. The outer right windshield shattered, the design speed was achieved, and USAF Major Robert M. White attained a world record maximum speed of 6587 kph (Mach 6.04) and an altitude of 30.968 km. NASA/USAF launched X-15A VO Stab, Bound.Layer Test mission # 74 with maximums of 1640 kph (Mach 1.49), 16.450 km altitude. The engine only gave 35% power, gear failure seriously damaged the the X-15 in a Mud Lake emergency landing, John McKay was injured. Purple Mountain Observatory discovered asteroids #1888 Zu Chong-Zhi #1972 Yi Xing, #2027 Shen Guo, #2169 Taiwan amd #2963. The Great Northeast Blackout of 1965 occurred: All of New York State, portions of seven neighboring states, and parts of eastern Canada were hit by a series of power failures which lasted up to 13.5 hours. On Tuesday 9 November 1965, at approximately 5:16 PM Eastern time, a small variation of power originating from the Robert Moses generating plant in Lewiston, New York caused a protective relay on one of the transmission lines to trip at the Sir Adam Beck Hydroelectric Power Station No. 2 in Queenston, Ontario (near Niagara Falls), disabling a main power line heading into Southern Ontario. The power on the tripped line transferred to the other lines, causing them to become overloaded. Their own protective relays tripped, isolating Beck Station from all of Southern Ontario. With no place else to go, Beck's excess power flowed east over interconnected lines into New York state, overloading them as well, isolating the power generated in the Niagara region from the rest of the grid. The Beck generators, with no outlet for their power, were automatically shut down to prevent damage. Within five minutes, the power distribution system in the Northeast was in chaos as the effects of overloads and the subsequent loss of generating capacity cascaded through the network. While some generators in the region managed to stay online, resulting in isolated pools of powered customers, most of the stations in the region experienced load imbalances and automatically shut down. New York City was mostly dark by 5:27 PM, and over 30 million people in an area covering 80,000 square miles (207,000 sq. km) were left without electricity for up to 13 hours. Power to the Southern States was not affected only because of the limited interconnection with the Northeast's grid. Power restoration was uneven. Most generators had no auxiliary power to use for startup, complicating the process. Parts of Brooklyn, where the Midwood section had never lost power, were repowered by 11:00 PM, and the rest of the borough by midnight. However, the remainder of New York City was not returned to normal power until nearly 7:00 AM the next day. Power in western New York was restored in a few hours since Eastman Kodak's independent generating plant in Rochester, New York, which stayed online throughout the blackout, was able to provide auxiliary power to restart other generators in the area. In turn, the restored stations were used to get all of the generators in the blackout area going again. This event happened on a particularly cold November evening when power demands for heating, lighting, and cooking were pushing the electrical system to near its peak capacity. While steps were taken to reduce the chances of a similar occurrence in its wake, the event illustrated how dependent on a reliable supply of electricity modern society has become. Generating capacity has grown, but the demand for power has as well - and this event only affected one region of the US. Throughout the world, more people become more dependent on electricity every day as the global standard of living is raised. At the same time, we are depleting one of the primary sources of energy for the system, fossil fuels - oil and natural gas - at an accelerating rate. Before long, unless we do something to bring in a massive outside source of energy, the system is going to break, with blackouts becoming the norm rather than the exception as the power grid gets overloaded on a regular basis. Building solar power satellites in geostationary orbit, collecting the Sun's abundant energy and beaming it down to power the globe's electric systems, is the objective of The L5 Development Group. It is the safest, most reliable plan for assuring another "great blackout" such as the one that occurred on 9 November 1965 will not happen again, through addition of an effectively boundless supply of generating capacity powered by the Sun. NASA launched the unmanned Apollo 4 mission from Cape Kennedy, Florida, the first Saturn V flight, to test the Apollo reentry module. The unmanned Saturn/Apollo 4 (AS-501) flight was launched 9 November 1967 in the first all-up test of the three stage Saturn V launch vehicle, and of the CM heatshield. The Saturn V, used for the first time, carried a Lunar Module test article (LTA-10R) and a Block I Command and Service Module (CSM 017) into orbit from the Kennedy Space Center Launch Complex 39, Pad A, lifting off at 7:00:01 AM EST - one second later than planned. 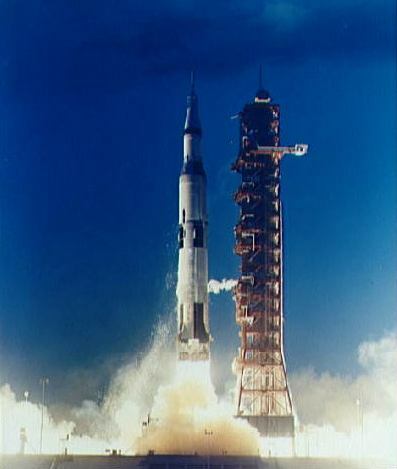 This was the first flight of the Saturn V, the largest launch vehicle ever constructed. It was also the first launch from Launch Complex 39, which was specifically built for the Saturn V. As well as being the first launch of the S-IC first stage and S-II second stage, it was also the first time that the S-IVB third stage was restarted in Earth orbit, and the first time that the Apollo spacecraft reentered the Earth's atmosphere at speeds approaching those of a Lunar return trajectory. Because of all these firsts, there were 4,098 measuring instruments on board the rocket and spacecraft. It was also the first test of the "all-up" doctrine: It had been decided in 1963 that instead of testing each component of the rocket separately as had been done by Wernher von Braun in Germany during World War II, the rocket would be tested all at once. This cut down on cost, but meant that everything had to work properly the first time. The mission was designed to test all aspects of the Saturn V launch vehicle, to demonstrate the structural and thermal integrity of the space vehicle, to verify adequacy of the Block II heatshield design for entry at Lunar return conditions, and also returned pictures of Earth taken by the automatic Command Module apogee camera from about one hour before to one hour after apogee. Mission objectives included testing of structural integrity, compatibility of launch vehicle and spacecraft, heat shield and thermal seal integrity, overall reentry operations, launch loads and dynamic characteristics, stage separation, launch vehicle subsystems, the emergency detection system, and mission support facilities and operations. These objectives were accomplished. 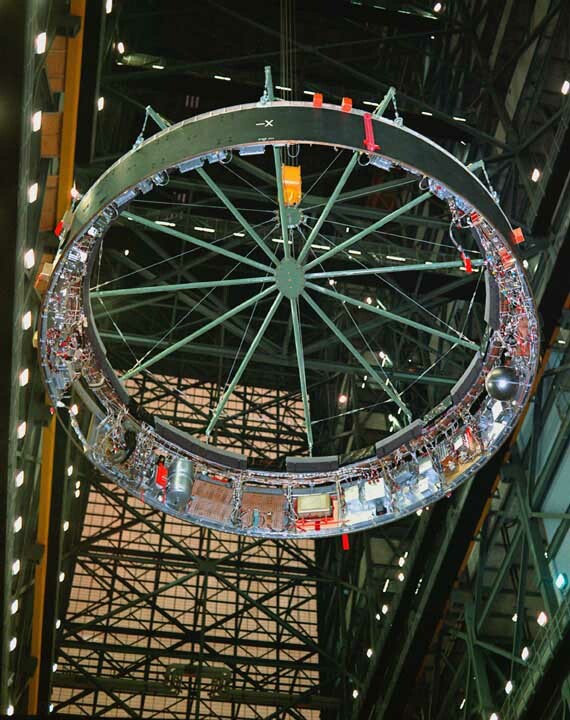 The S-IC stage cutoff occurred 2 minutes 30 seconds into the flight at an altitude of about 63 kilometers. The S-II stage ignition occurred at 2 minutes 32 seconds, and the burn lasted 6 minutes 7 seconds, followed by the S-IVB stage ignition and burn of 2 minutes 25 seconds. Orbital insertion of the S-IVB and spacecraft combination was achieved by ignition of the third (S-IVB) stage, putting the spacecraft (S-IVB and CSM) into a 184 x 192 km parking orbit with a period of 88.2 minutes and an inclination of 32.6 degrees. After two orbits, which required about three hours, the S-IVB stage was reignited to place the spacecraft in a simulated Lunar trajectory, with a burn that lasted five minutes putting the spacecraft into an Earth-intersecting trajectory with an apogee of 17,346 km. About ten minutes after completion of the S-IVB burn, the spacecraft and S-IVB stage were separated, and less than 2 minutes later the service propulsion subsystem (SPS) ignited for 16 seconds, raising the apogee to 18,216 km. The spacecraft was placed in an attitude with the thickest side of the CM heatshield away from the solar vector. During the following 4.5 hour cold-soak period, the spacecraft coasted to its highest apogee - 18,256.3 kilometers. A 70 mm still camera photographed the Earth's surface every 10.6 seconds, taking 715 good-quality, high-resolution pictures. About 8 hours 11 minutes after liftoff the service propulsion system was again ignited for 271 seconds to increase the spacecraft inertial velocity to beyond Lunar return trajectory velocities, to simulate entry from a translunar mission. SPS cutoff was followed by separation of the Command Module (CM) from the Service Module and orientation of the CM for reentry. Atmospheric entry at 122 km altitude occurred at a flight path angle of 7.077 degrees with a velocity of 11.140 km/second. The CM landed in the primary recovery area in the Pacific Ocean near Hawaii at 20:37 UT 9 November 1967, 8 hours 37 minutes after liftoff, about 16 km from the target landing point, at 30.06 N 172.32 W. Although it landed 16 km from the target, its descent was visible from the deck of the carrier USS Bennington, the prime recovery vessel. The Command Module, apex heatshield, and one main parachute were recovered. Recovery time of 2 hours 28 minutes was longer than anticipated, with the cause listed as sea conditions - 2.4-meter (8 foot) swells. The Apollo 4 Command Module is on display at NASA's John C. Stennis Space Center, Bay St. Louis, Mississippi. NASA launched a Scout B from Wallops Island, Virginia, carrying the OFO 1 (Orbiting Frog Otolith) and RM-1 (Radiation Meteoroid) satellites into orbit. OFO 1 (Orbiting Frog Otolith) was launched 9 November 1970. The satellite carrying the OFO-A experiment remained in orbit for almost seven months, reentering the atmosphere on 9 May 1971. Recovery of the spacecraft was not planned. The objective of the experiment was to investigate the effect of microgravity on the otolith, a sensory organ that responds to changes in an animal's orientation within the Earth's gravitational field. The payload was the Frog Otolith Experiment Package (FOEP), instrumented to obtain the first direct recordings of otolith response during prolonged periods of weightlessness. In-dwelling microelectrodes were implanted in the vestibular nerves of two bullfrogs (Rana catesbeiana) to measure the bioelectric action potential in the animals during weightlessness and during repeated simulated gravity stimulus obtained by activation of a small centrifuge. The primary data obtained include (1) the instantaneous rate of firing from single vestibular units (data were recorded from two microelectrodes implanted in each of the frogs), (2) centrifugal acceleration profiles measured at the head of each frog, (3) EKG as a vital index of animal welfare, and (4) water environment temperature, because of the relation of temperature to vestibular activity. The instrumentation for the experiment was contained in a biopackage configured to assure survival and normal function of the two frogs for the duration of the experiment. Data were telemetered to ground stations. Felix Aguilar Observatory discovered asteroid #2075 Martinez; P. Wild discovered asteroid #2950. N. G. Thomas discovered asteroid #2089 Cetacea. E. Bowell discovered asteroids #2600 Lumme and #3015 Candy. A Delta 7000 launched from Vandenberg, California, carried 5 Iridium commercial communication satellites into orbit (Iridium 38-41, 43), which were placed in Plane 6 Ascending nodes at 325.7 +/-0.1 degrees. A total Lunar eclipse was seen in the Americas, Europe, Africa, and Central Asia, the second of two total lunar eclipses in 2003.